In this latest book, as stated in the foreword, the author has extracted the grains of gold in Manu Smriti excluding the unwanted material, so that these values are made known and available to the Society. "Eternal Values in Manu Smriti" by Justice M. Rama Jois is yet another string of treasure trove beginning with "Legal and Constitutional History of India" in two volumes, highlighting the existence and application of invaluable eternal values in jurisprudence operated in India from millenniums, relevant and akin to the modem concepts of constitutional law-civil and criminal law and moral code of conduct. The rich heritage and source for the treasure is from Vedas, Upanishads, Geeta, commentaries thereon as their illustrative are Mahabharata as well as Ramayana. 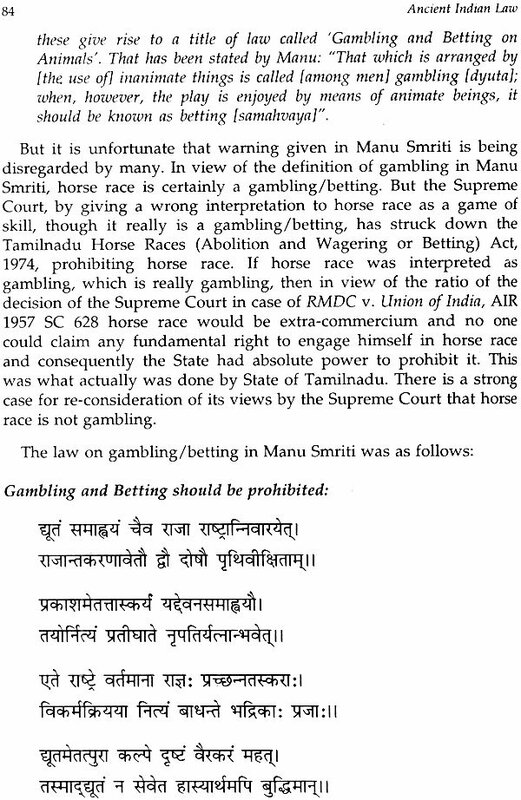 Manu Smriti occupied centre stage leading commentary next to Yajnavalkya. 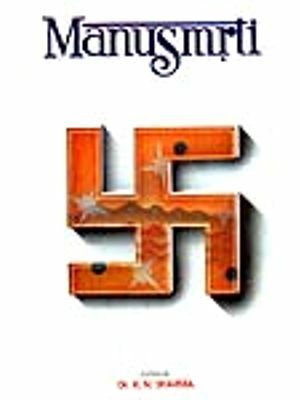 As civilisation advances, the political and social consciousness grew awareness among the people and Manu Smriti became the subject of wholesale condemnation. Baba Saheb, Bharat Ratna, Dr. B.R. Ambedkar, bonfired it at a public gathering. Among the 'shudras', to whom Manu Smriti denied education, dalits are the worst sufferers depriving them education, economic empowerment, social and political rights and cultural pursuits and condemned them to menial/despicable avocations. 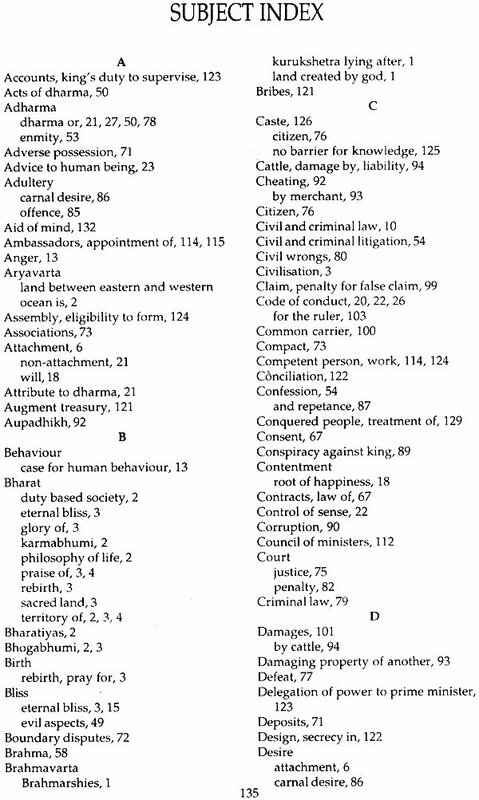 Brother - Justice Rama Jois has opened up his heart in his preface to this book that Vedas are the primordial source of Dharma, Smritis are secondary source codifying the roots of virtuous conduct, regulate the conduct of the individuals, relations inter se and duty to the society and rights of the rulers and the ruled, and so on. The purpose and object thereof are for the good of the individuals, social stability and harmony. 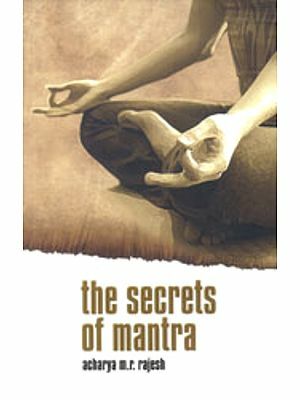 Manu Smriti consists of 2,694 verses in 12 Chapters. He is candid to admit that there are several provisions in Manu Smriti which have come in for severe criticism. 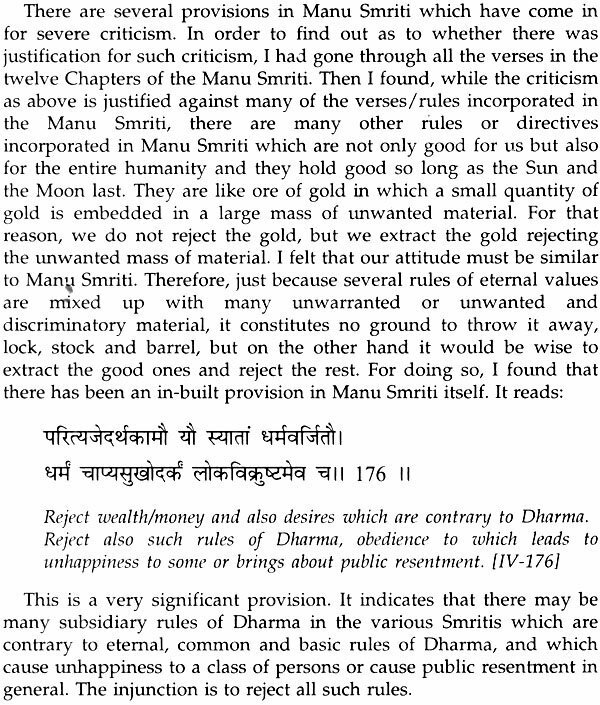 In order to find out as to whether there was justification of such criticism, I have gone through all the verses in 12 Chapters of Manu Smriti. 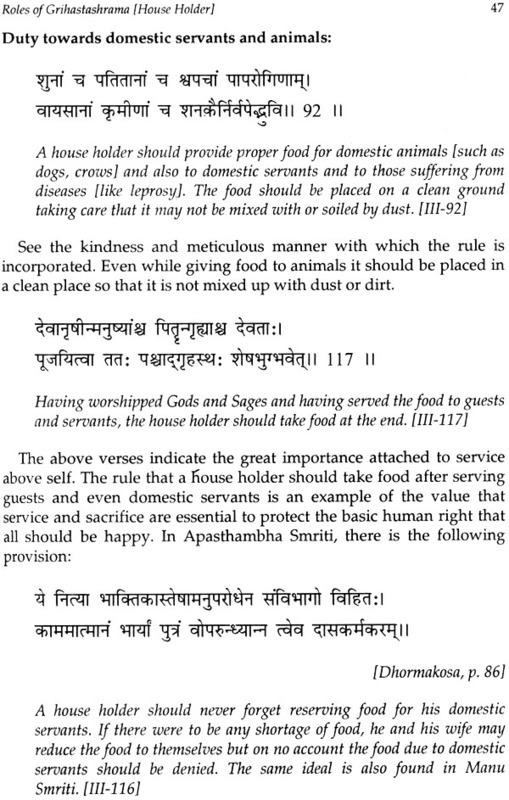 Then I found while the criticism as above is justified against many of the verses/ rules incorporated in Manu Smriti, there are many other rules or directives incorporated in Manu Smriti which are not only good for us but also for the entire humanity and they hold good so long as the Sun and the Moon lasts. Therefore, he avoided the weed which inflicted immense damage to the society and reiterated the grains of gold therein and has given his commentary as eternal values. He has also elaborated that several commentaries on Manu Smriti have been written in Sanskrit, among them six were more notable. 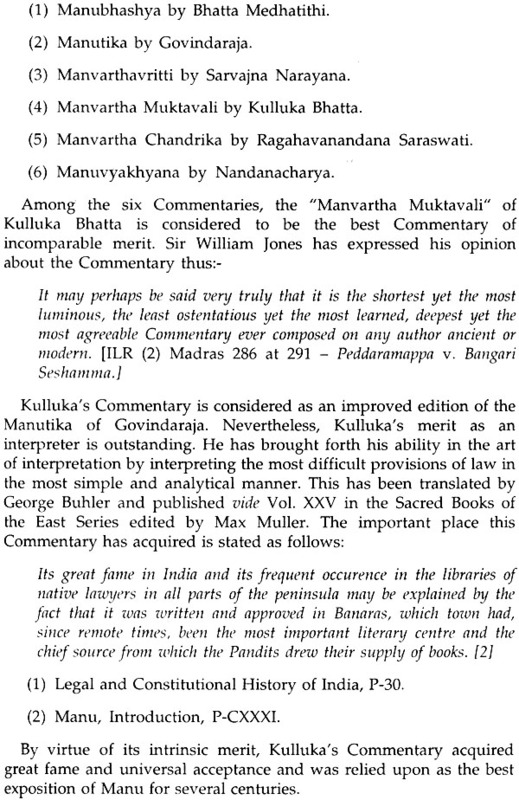 Of them "Manvartha Muktavali" of Kulluka Bhatta is considered to be the best commentary of incomparable merit appreciated by Sir William Jones and Max Muller, the noted English commentators. 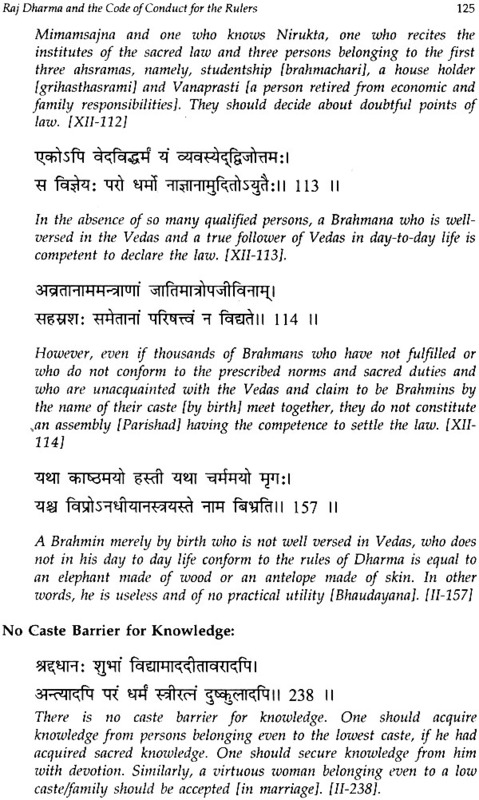 Vedas and Upanishads do not speak of casteism or caste structure. Everyone was treated alike. 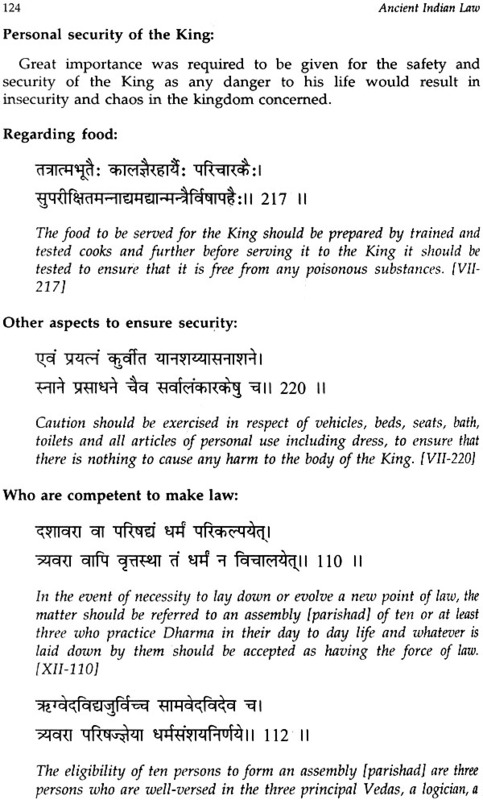 Sanskrit was the lingua Franca, patronaged by the rulers. 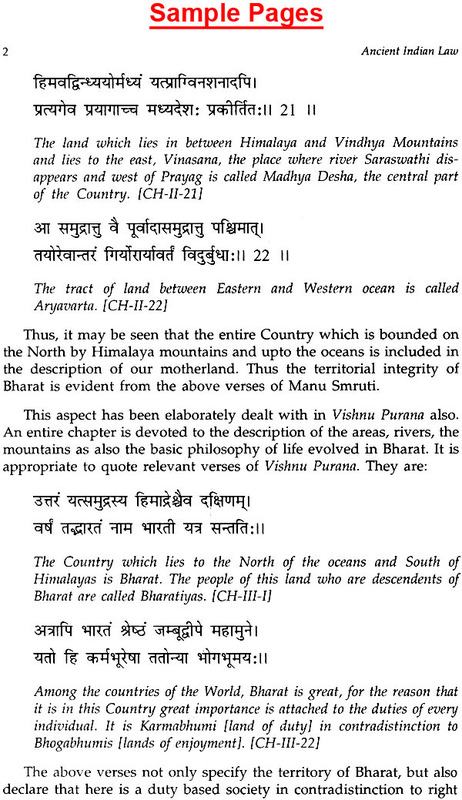 The educated dominated in practice, propagation, interpretation and teaching of vedic knowledge. 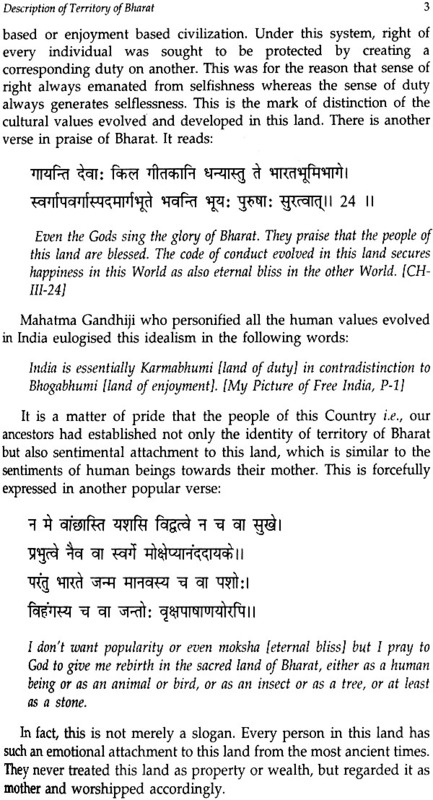 Degeneration of interpolation in Smriti appears to have roots in Bhagwad Geeta laying foundation for hierarchical caste system. The commentators predominated by Manu Smriti, erected impregnable walls of separation between four castes namely Brahmins, Kshatriyas, Vaishyas and Shudras who were assigned their respective duties. Brahmins assumed practice, propagation, teaching and interpretation of Vedic knowledge, conducted rituals and performed duties of the priest. The Vedic religion was the only one religion practiced by all the people during the period. Therefore, Brahmins having gained accessibility to the rulers as well as the performance of the rituals, it was interpolated that the cows and Brahmins will be respected and the people, king and the kingdom, will be happy when they are honoured. Example will be found in Shantistava, the benediction pronounced at the conclusion of all religious rituals lay emphasis on it. The caste hazimony was expounded through the mouth of Lord Krishna, a non- Brahmin, who gave legitimacy to the system saying that he created the castes and the Brahmins occupy the top position. In that perpetration, the Indian culture, shaped through Vedic knowledge has occupied most important branch of intellectual discourse and writing in Sanskrit again predominated by the priest class. The primacy given to the spirituality and study of philosophy contained in the Vedas has brought about Sanskrit language to a pre-eminent position predominated by the priest class. The rich cultural heritage was monopolised by the dominant section and denied the shudras the benefit of education, cultural development and economic status. But the ultimate weakness and failing of the caste system and the Indian social structure were that they degraded a mass of human beings and gave them no opportunities to get out of that condition- educationally, culturally or economically. It led to the petrifaction which became a dominant feature of India's economy and life. In the context of society today, the caste system and much that goes with it are wholly incompatible, reactionary, restrictive, and barriers to progress. The hierarchical caste structure woven as a built-in social structure in Manu Smriti put the Dalits at its bottom given untouchability, a social and religion sanction and denied them the human rights and their pangs are still haunting them from cradle to grave as irredeemable. Even after 53 years of independence and 51 years of Constitution operating, their conditions are appalling. The centrality of human rights is the "dignity of the individual", "liberty" and "equality of status" and to make them meaningful, woven around the right to education, health, shelter, congenial environment without discrimination as basics to unity and fraternity among the people, civil and political rights, social, economic and cultural rights have been elaborated to feed and give content to the human rights. 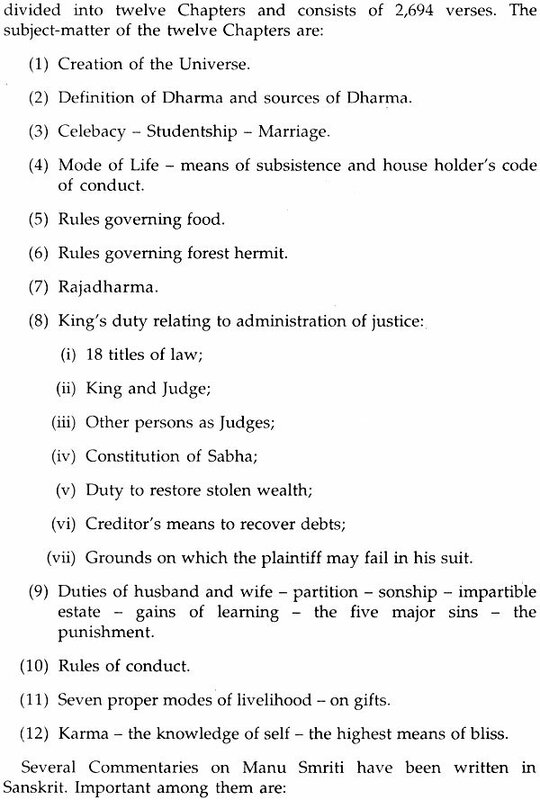 The Constitution of India, in its Preamble, laid pragmatic panorama of constitutional philosophy to usher in the egalitarian social order under rule of law. The State, namely, the Legislature, the Executive and the Judiciary, drawn from the will of the people, has been invested with the power and duty to bring about united and integrated Bharat through human rights as instrumentalities to achieve the ethiopian goal of social, economic and political justice, equality of opportunity, status and dignity to all people. The conception of human rights is of central importance in the development of modem democracy under rule of law. Humane governance of civil society could be the reality only when Dharma, rich in its content, is applied justly. Integration of human rights, social justice, equality and gender justice are necessary for social integration in an inclusive democracy so that the fun potential of all individuals and to constantly improve excellence individually and collectively, which is a fundamental duty, benefits the nation. Equality and humane treatment of all sections of the population is an essential component of justice. Human development, together with ensuring and enjoyment of human rights, would be the surest way to build a cohesive society and integrated 'Bharat'. 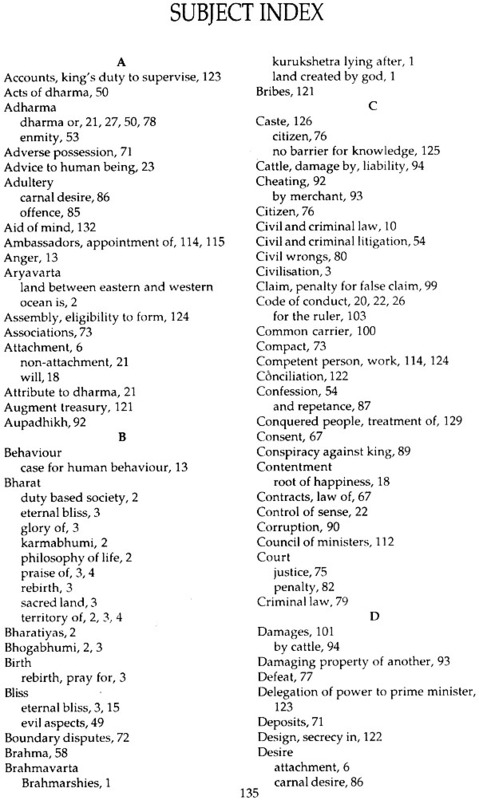 Law is a social engineering to help the citizens. Unless they improve their thinking process, human rights spirit and human rights culture, casting aside the caste, communal, regional, linguistic or religious bitterness and distrust in favour of ushering in a just and humane governance in participatory democracy unity will remain a pious platitude. Distributive justice must be a part of inclusive democracy for humane governance. 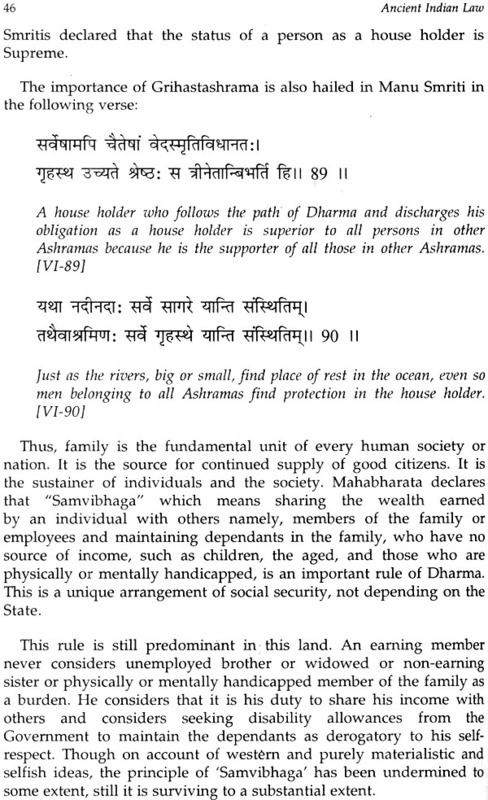 Dharma defined in its widest connotations inculcates the spirit of participatory democracy among the people and provides the hindsight to rid of narrow prejudices to pave the way for fraternity diglot pluralistic society.